This pretty one skein scarf is worked back and forth from one end to the other and features a soft curve. 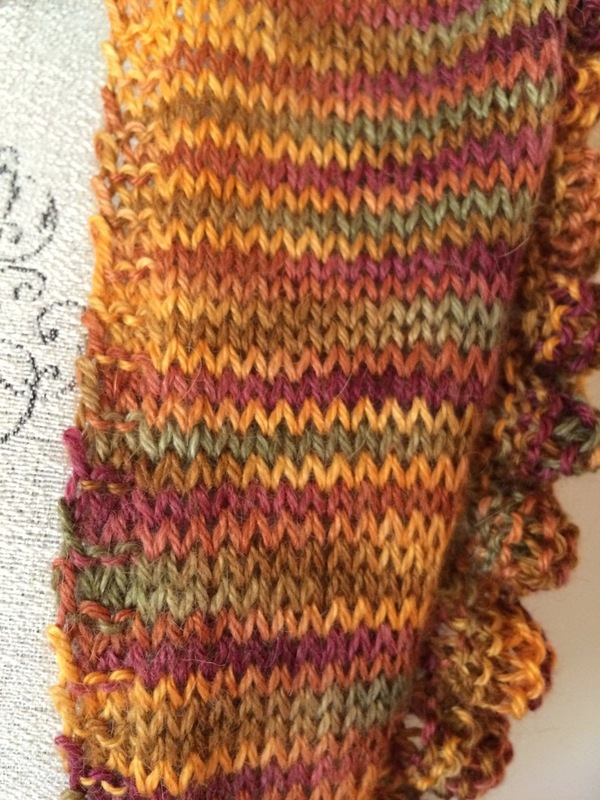 Then stitches are picked up and worked in garter stitch to create the ruffle. It features hand painted Katy yarn for luxurious drape and feel. Hello Noble Knitters! It's Nancy Queen and I'm back today to talk to you about the Katy Ruffle Scarf Free Knitting Pattern. It's available at NobleKnits.com on our blog. It's a free pattern that you can download. I want to tell you about the construction of it and the yarn that we used and why we chose it. This one uses Fiesta Yarns hand dyed Katy yarn. This is a gorgeous blend of alpaca and silk. It's 70% alpaca and 30% silk so the drape is unbelievable. It's luxurious and soft and it's not heavy at all - it feels light as a cloud. It's great for just covering up a little bit. I'm going to take this off so you can see this scarf. It's knitted from one end to the other. We start at one end with just a couple of stitches, down here at the end with just 4 stitches. And you'll just knit in stockinette stitch all the way until you get to the center. You'll increase all the way to the center. Then, on the way down, you'll decrease back down to tiny, tiny, tiny. Once you get halfway through, you're home free and then the rows get really fast and easy - which I love. Then, to make this a seamless project, we pick up along the long edge and add a ruffle. The ruffle is done in garter stitch. So it's a lot of stitches, but you're just knitting, knitting, knitting and it give a really nice texture to the project. I'm going to give you a closeup of it so you can see how you get a little bit of halo with the yarn - and just how soft it is and the texture with the garter stitch makes it really pretty. Again that is the Katy Ruffled Edge Scarf, a free pattern available at NobleKnits.com on our blog. Let us know in the comments - what you like, what you want to see, what else we can make to show you!